Lee Boon in Milan on 02 June 2012. Fabio Sacco, also known as Lee Boon, is an Italian karter from Asti. He joined the international scene when Mario Kart DS was released: he became a very famous karter in the community for his strong WRs and his funny english. He was also very famous among WiFi players (he was one of the first people to PRB consistantly on courses like RMC1). In September 19th 2006, Fabio struck back on F8C taking the flap WR from Sascha Brauninger with 24"664. More importantly, he defeated BDash's F8C 3lap going sub 1'15 first with an amazing time of 1'14"971 (24"556 - 25"240 - 25"175) with the first lap as a new flap WR of 24"556. Fabio beat his F8C flap once more going sub 24"500 first getting a great time of 24"494. 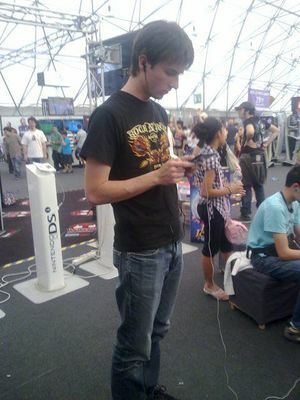 Considered a God together with G-danzee, DarkRoy and NikeXTC in the Italian MK community, Fabio has stopped his MKDS Time Trials activity in first months of 2007 to focus exclusively on WiFi. Fabio invested himself in WiFi a lot, doing his best to meet and face the fastest racers from all around the world. Due to his unbelievable skills with items and his big luck, during this period he is called "The Lucky One". The most incredible and remarkable race battle has been for the spot of WiFi #1 with the famous Swiss racer Thomas Bolton, after an epic 20 races lost 13-15 after two extra GPs. This major December 2006 event is what made Thomas become the true WiFi champion. In September 2nd 2009, Fabio after 3 years got back on the charts. Utilizing a new triple hop technique, he did it in the most epic fashion by taking the Baby Park flap which is the oldest WR to date down by just 1 thousandth with 8"144 beating the legendary time set by Fabien da Silva over 2 years earlier. As he has competed in several kart games, he places at respectable 25th in the Combined rankings. Fabio is also one of the best providers of videos, and he is always willing to share his strategies with people. Currently, he's playing Mario Kart DS. He also played Super Mario Kart, Mario Kart 64, Mario Kart Super Circuit, Mario Kart Double Dash, Mario Kart Wii and Mario Kart 7. The January 2006 news update of the MKDS site, speaking about Fabio getting the italian champion title for the first time. The September 2009 news update of the MKDS site, speaking about Fabio getting a new WR in Baby Park flap. Fabio is very famous also thanks to the "idolo", his totally own term to congratulate with someone. He calls several karters "idolo", like Lars Stelzig and Etch. He is a self-proclaimed sucker at english. Other than karting, he is a big fan of shmups, fantasy books and metal music. Always calls DarkRoy "Nipote" (italian for nephew) while actually they aren't relatives. DarkRoy also proclaims hisself his nephew. His isolation from the world is currently underway. This page was last modified on 4 March 2019, at 06:42.